After the antichrist, his prophet, and the devil are defeated, Jesus will set up peace on earth. This time period will be 1,000 years which has been called the Millennial Reign of Christ. Jesus will forever rule over the earth with His servants from this point on. Jesus will set up His capital in Jerusalem . It will be a time of unprecedented peace between men and even the animal kingdom. Much of the physical earth has been changed dramatically at the coming of the Lord and His judgments. There are much fewer men on the earth by this point. Those leftover will start to rebuild again. All will know who the Lord is and will be given the choice to follow Him or reject Him. Isa 65:20 There shall be no more thence an infant of days, nor an old man that hath not filled his days: for the child shall die a hundred years old; but the sinner being a hundred years old shall be accursed. During the Millennium death will still be possible. However, something different in the Millennial Reign is that men will live to be much much older than they do now. In fact, a man may even be able to live during the entire 1,000 years. This verse in Isaiah is pointing out that if someone dies at the age of 100, they will be considered as dying extremely young like a child would be to us today. Let us look at the three groups, the Jews, the nations, and the Church, in this time period to see what each will be doing. Jer 30:3 For, lo, the days come, saith the LORD, that I will bring again the captivity of my people Israel and Judah , saith the LORD: and I will cause them to return to the land that I gave to their fathers, and they shall possess it. The Jews of today are praying for and taking part in what is called Aliyah, which means the returning of the Jews to their homeland Israel . Less than half the Jews in the world have done this. However, during the Millennium, there will be a great Aliyah when all the Jews will go back to the land that was promised Abraham. They will possess the fullness of what God had promised thousands of years ago but have never been able to accomplish on their own. They will own the land from the Mediterranean Sea to the Euphrates River. Glory to God! Jer 23:5, 6 Behold, the days come, saith the LORD, that I will raise unto David a righteous Branch, and a King shall reign and prosper, and shall execute judgment and justice in the earth. In his days Judah shall be saved, and Israel shall dwell safely: and this is his name whereby he shall be called, THE LORD OUR RIGHTEOUSNESS. The Jews from this point on and forever will dwell in safety. It will actually be the first time in the history of the Jewish nation that they did not have to fear terrorism, war, and genocide. Jesus and God the Father will be their protector. How glorious it will be! Mic 4:7, 8 And I will make her that halted a remnant, and her that was cast far off a strong nation: and the LORD shall reign over them in mount Zion from henceforth, even forever. And thou, O tower of the flock, the stronghold of the daughter of Zion , unto thee shall it come, even the first dominion; the kingdom shall come to the daughter of Jerusalem . 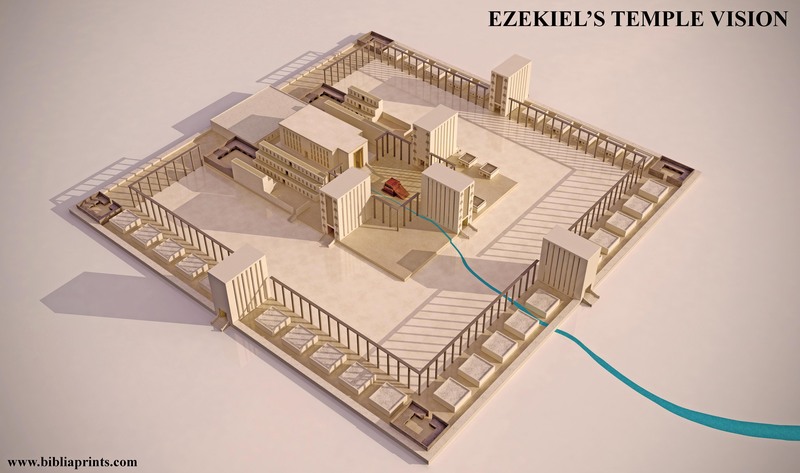 Jesus will rule from the earthly Jerusalem, in Ezekiel’s Temple (Ezekiel 40-48), and the heavenly Jerusalem in 2nd Heaven . Remember, His glorified body can manifest both here on Earth and in Heaven, as will our bodies. We will rule in the heavens with Him over the whole earth. Isa 60:1 – 5, 19 – 22 Arise, shine; for thy light is come, and the glory of the LORD is risen upon thee. For, behold, the darkness shall cover the earth, and gross darkness the people: but the LORD shall arise upon thee, and his glory shall be seen upon thee. And the Gentiles shall come to thy light, and kings to the brightness of thy rising. Lift up thine eyes round about, and see: all they gather themselves together, they come to thee: thy sons shall come from far, and thy daughters shall be nursed at thy side. Then thou shalt see, and flow together, and thine heart shall fear, and be enlarged; because the abundance of the sea shall be converted unto thee, the forces of the Gentiles shall come unto thee… The sun shall be no more thy light by day; neither for brightness shall the moon give light unto thee: but the LORD shall be unto thee an everlasting light, and thy God thy glory. Thy sun shall no more go down; neither shall thy moon withdraw itself: for the LORD shall be thine everlasting light, and the days of thy mourning shall be ended. Thy people also shall be all righteous: they shall inherit the land forever, the branch of my planting, the work of my hands, that I may be glorified. A little one shall become a thousand, and a small one a strong nation: I the LORD will hasten it in his time. The Jews will be sought after by the nations to seek God on their behalf. The nations will see the glory of God emanating from Jesus in Jerusalem and will come bearing gifts to the Jews and God. Mat 19:28 And Jesus said unto them, Verily I say unto you, That ye which have followed me, in the regeneration when the Son of man shall sit in the throne of his glory, ye also shall sit upon twelve thrones, judging the twelve tribes of Israel . The twelve apostles of the Lamb will be the judges over the nation of Israel . Jer 31:1 At the same time, saith the LORD, will I be the God of all the families of Israel , and they shall be my people. All Israel will be saved during this time period fulfilling what Paul said in Romans 11:26. Every Jew will be associated with believing in the LORD Jesus Christ. How amazing that will be compared to the time we live in now. Mic 4:4, 5 But they shall sit every man under his vine and under his fig tree; and none shall make them afraid: for the mouth of the LORD of hosts hath spoken it. For all people will walk every one in the name of his god, and we will walk in the name of the LORD our God forever and ever. During the Millennium, man will continue to have a free will to choose to reject God or accept Him. All the nations of the world will come into the knowledge of Jesus and what He has done. Because sin will still be in the earth, death will still be in the earth. Men will still be depraved and will need a savior. Zec 14:16 – 21 And it shall come to pass, that every one that is left of all the nations which came against Jerusalem shall even go up from year to year to worship the King, the LORD of hosts, and to keep the feast of tabernacles. And it shall be, that whoso will not come up of all the families of the earth unto Jerusalem to worship the King, the LORD of hosts, even upon them shall be no rain. And if the family of Egypt go not up, and come not, that have no rain; there shall be the plague, wherewith the LORD will smite the heathen that come not up to keep the feast of tabernacles. This shall be the punishment of Egypt , and the punishment of all nations that come not up to keep the feast of tabernacles. In that day shall there be upon the bells of the horses, HOLINESS UNTO THE LORD; and the pots in the LORD’s house shall be like the bowls before the altar. Yea, every pot in Jerusalem and in Judah shall be holiness unto the LORD of hosts: and all they that sacrifice shall come and take of them, and seethe therein: and in that day there shall be no more the Canaanite in the house of the LORD of hosts. Jesus will make a decree for the nations of the world to come and worship the true God. Those nations that reject Jesus as Lord will rebel and will suffer draught. Those that obey will be blessed. Isa 2:1 – 4 The word that Isaiah the son of Amoz saw concerning Judah and Jerusalem . And it shall come to pass in the last days, that the mountain of the LORD’s house shall be established in the top of the mountains, and shall be exalted above the hills; and all nations shall flow unto it. And many people shall go and say, Come ye, and let us go up to the mountain of the LORD, to the house of the God of Jacob; and he will teach us of his ways, and we will walk in his paths: for out of Zion shall go forth the law, and the word of the LORD from Jerusalem. And he shall judge among the nations, and shall rebuke many people: and they shall beat their swords into plowshares, and their spears into pruning hooks: nation shall not lift up sword against nation, neither shall they learn war any more. Many nations will choose to follow Jesus and will come to Jerusalem to worship Him. Hallelujah! Jesus will make the Law go out from Jerusalem to all the earth. He will judge all nations on behalf of God the Father and will chastise those who will not obey. War will be no more. People today try to eradicate war but it is futile to try and wrong. War is necessary as long as evil men try to dominate and oppress people. But when Jesus rules, such circumstances will fade away for 1,000 years. No one will form armies or learn war or make weapons. The reign of peace does not mean that there will be no discomfort. There will be severe judgment for those that do not follow God. They will be utterly destroyed even during the Millennium if they do not repent. Jesus is reversing the rampage of sin that has been running throughout the earth for the last six thousand years. It will be extremely violent for those that do not want to let go of their sin. When every knee has bowed to Jesus in subjection and every tongue confessed that His is Lord (Phil 2:10) is when Jesus will hand all things back over to God the Father that God may be all in all. Rev 20:4 And I saw thrones, and they sat upon them, and judgment was given unto them: and I saw the souls of them that were beheaded for the witness of Jesus, and for the word of God, and which had not worshiped the beast, neither his image, neither had received his mark upon their foreheads, or in their hands; and they lived and reigned with Christ a thousand years. The Church will reign with Christ on the Earth and Second Heaven. We, the Church of the Lord Jesus Christ, will certainly take part in the first resurrection. Death will have no power over us ever again. We, who have glorified bodies, will help Jesus rule the earth for 1,000 years from the heavens. You must understand that there are three heavens. The third heaven is where God the Father is seated on the throne. The second heaven is the spirit realm that is above the earth from which spiritual rulers have authority over the earth. It is this heaven from which we will be ruling. The first heaven is the physical heaven where we can see the sky, sun, moon, stars, etc.. I imagine we will be able to traverse from the third heaven to the second heaven at will. However, I am not sure if we will be allowed to manifest ourselves on the earth at will with our glorified bodies. I am sure Jesus will give us instruction as to what the limitations may be for the Millennial Reign, if there are any. I look forward to finding out. 1Co 6:2, 3 Do ye not know that the saints shall judge the world? and if the world shall be judged by you, are ye unworthy to judge the smallest matters? Know ye not that we shall judge angels? how much more things that pertain to this life? The saints of God will be judges of the world on behalf of Jesus. We will not only judge in the affairs of men but also of angels. Jud 1:14, 15 And Enoch also, the seventh from Adam, prophesied of these, saying, Behold, the Lord cometh with ten thousands of his saints, To execute judgment upon all, and to convince all that are ungodly among them of all their ungodly deeds which they have ungodly committed, and of all their hard speeches which ungodly sinners have spoken against him. One of the saints’ jobs will be to convict the sinners on the earth of their sin. We will judge so that men can repent and turn to Jesus. Mat 24:45 – 47 Who then is a faithful and wise servant, whom his lord hath made ruler over his household, to give them meat in due season? Blessed is that servant, whom his lord when he cometh shall find so doing. Verily I say unto you, That he shall make him ruler over all his goods. These verses in Matthew show us that not everyone will be a ruler with Christ. Only those that have been faithful in the present life will be deemed worthy to rule with Him in the Millennium. Notice that we will be rulers over all of Jesus’ goods which includes the Earth. Oh, how much help we will need from the Holy Ghost! We will need an intimate relationship with God, Jesus, and the Holy Ghost continually to be able to do such an important duty correctly. Rev 2:26 , 27 And he that overcometh, and keepeth my works unto the end, to him will I give power over the nations: And he shall rule them with a rod of iron; as the vessels of a potter shall they be broken to shivers: even as I received of my Father. Dan 7:18, 22, 26, 27 But the saints of the most High shall take the kingdom, and possess the kingdom forever, even forever and ever…Until the Ancient of days came, and judgment was given to the saints of the most High; and the time came that the saints possessed the kingdom…But the judgment shall sit, and they shall take away his dominion, to consume and to destroy it unto the end…And the kingdom and dominion, and the greatness of the kingdom under the whole heaven, shall be given to the people of the saints of the most High, whose kingdom is an everlasting kingdom, and all dominions shall serve and obey him. We will take the dominion that the devil has had over this earth for six thousand years and submit it all to the lordship of Jesus. The spiritual ruler-ship over the earth will forever be in the hands of God’s saints. Everything will be brought to the feet of Jesus and will submit in the end. Certainly it is true what Paul said in First Corinthians, “Eye hath not seen, nor ear heard, neither have entered into the heart of man, the things which God hath prepared for them that love him.” GLORY TO GOD! Hello children of the one true living God, please pray that you will be accounted worthy to escape the hour of temptation that is going to come upon the whole world. And pray that you will also be accounted worthy to stand in the presence of our Lord Jesus Christ, the Son of God. Ever since futurism was popularized in the early twentieth century by the publication of Scofield Bible Notes, there has been debate between those who have seen evidence that the millennial reign will be in heaven and those who have assumed that the millennial reign will be on Earth. This (July 2014) is the first time I seen any attempt to reconcile the biblical evidence with what has been almost universally accepted as “orthodoxy”.